Joe has chronic fatigue, weakness, and erectile dysfunction. He was doing well until 10 years ago when he started pain pills after a car accident which left him with chronic back pain. Left image: poppy field in Burma courtesy of wikimedia commons. 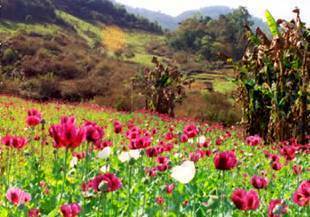 Poppies are source for opium, a narcotic pain medication. Joe has chronic fatigue, weakness, and erectile dysfunction. This entry was posted in jeffrey dach, Narcotics, Opioids, Pain Pills, Testosterone and tagged narciotics, Pain Pills, testosterone by Jeffrey Dach MD. Bookmark the permalink.